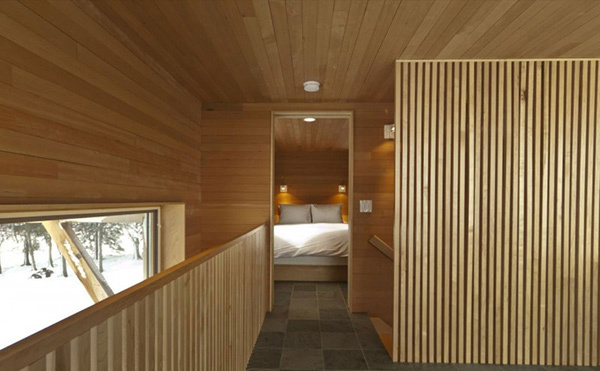 Would you love to stay in a guest house that gives you the feeling of being “at home”? For sure, you would! Our house feature today is a guest house made for the extended family and friends of the homeowner. 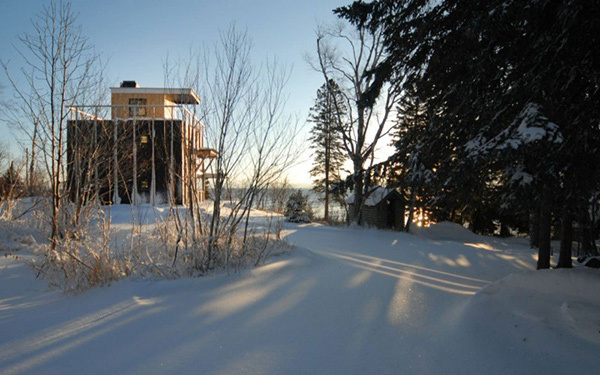 It sits on a granite cliff overlooking Lake Superior located in Tofte, Minnesota. The Rierson Cabin has open gathering space, sleeping areas and bathing functions on each level. The grade level has a kitchen, living, dining with a bedroom, bath and a mechanical room. The upper level of the house comprised or a gathering/game room, master bedroom, bath and sauna which is extended to the loft level with the paved roof as a gathering area. 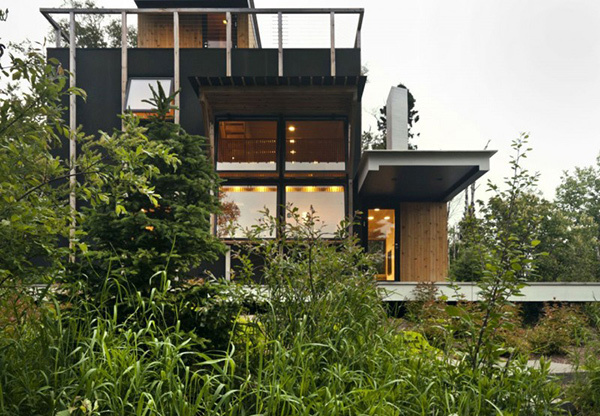 With plants and trees around it, this guest house really has created a special bond with nature. 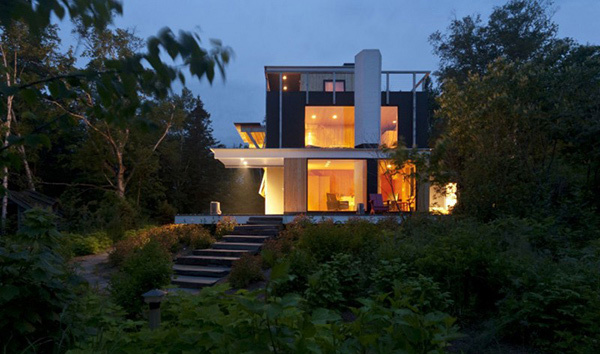 From a distance, the house when lighted at night looks like a peeping structure of flaring beauty! 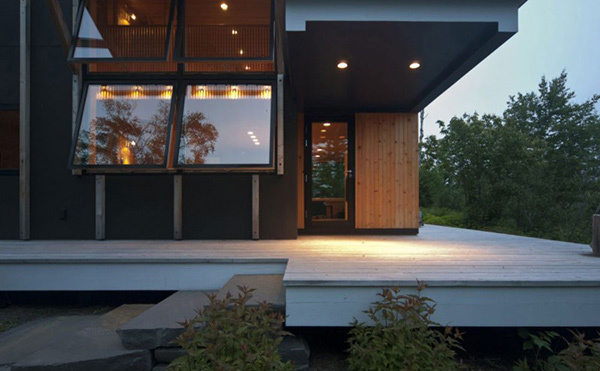 Materials used for the house are seen here with the black exterior cladding, wood, glass and masonry. The entrance of the house is a welcoming sight especially with all these lovely lights. You can see that the flooring is elevated from the ground with stone stairs and wooden decking. Another view of the deck showing the large windows that add ventilation to the house. 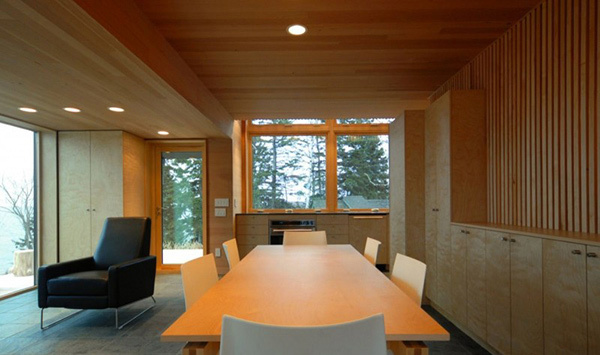 Wood is extensively used in the interior from the ceiling walls and even to wall partitions. 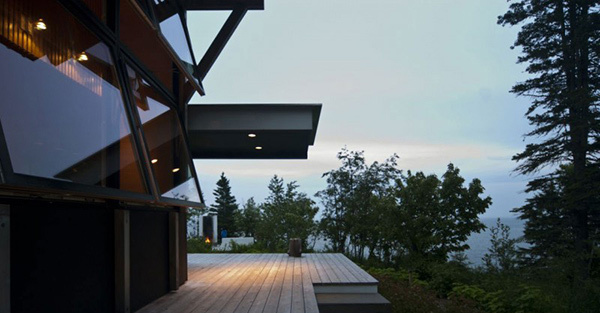 Glass walls surround the house giving the guests a better view of nature. 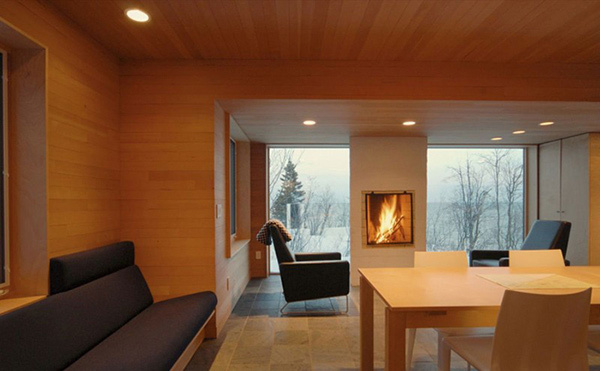 Look at that beautiful modern fireplace! It is indeed a perfect addition to this space especially that it adds warmth to it. The dining area is a small space located just beside the living room. Note the cabinets on the side that are made of wood. The kitchen has black countertop with wooden cabinets which looks perfect in the house. 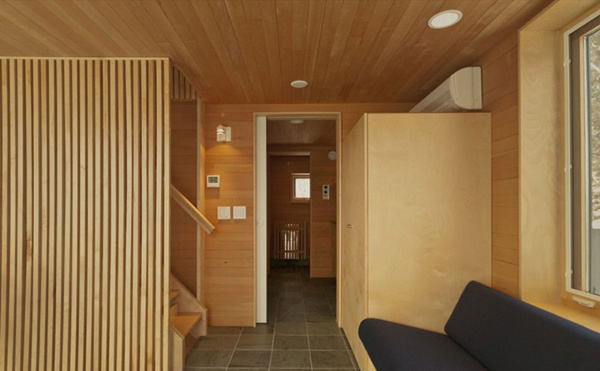 åç This hallway leads to a comfortable bedroom with white beddings and wooden interior. The facade of the house is clearly seen here since the trees are no longer there to cover it. From a distance, you can see the different levels of the house. 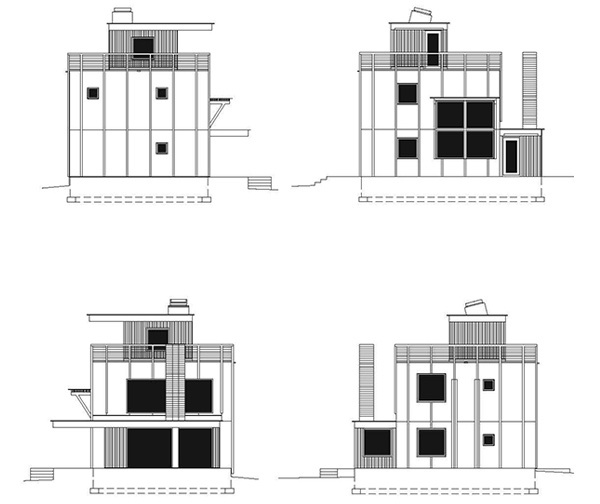 The floor plan showing the different areas of Rierson Cabin including the roof terrace. 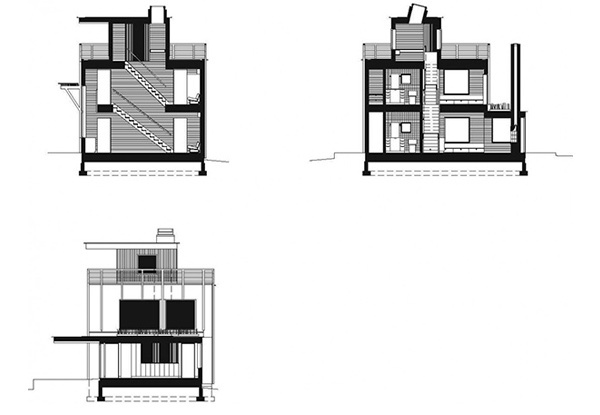 Get a better view of the house through this elevations. What you see now is the cross-section revealing what we can see inside. 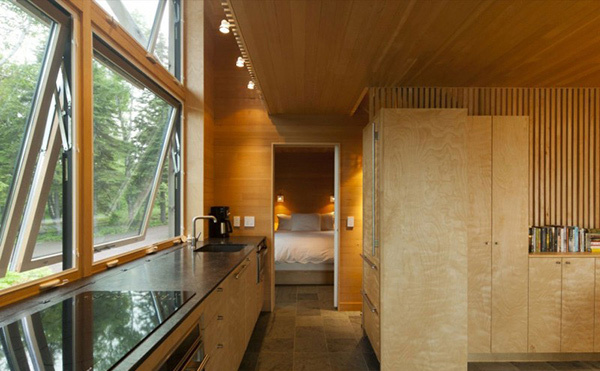 The Salmela Architects pointed out that, “All materials were selected to age with dignity. The smoothness of the maintenance-free black exterior cladding contrasts with the whitewashed masonry texture and naturally-aging wood surfaces. 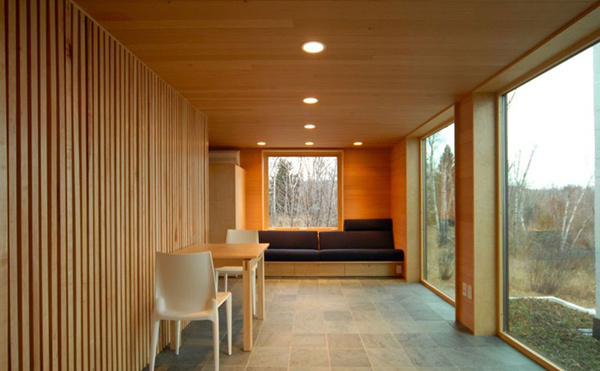 The consistency of minimal-maintenance materials continues on the interior with fir and birch surfaces. 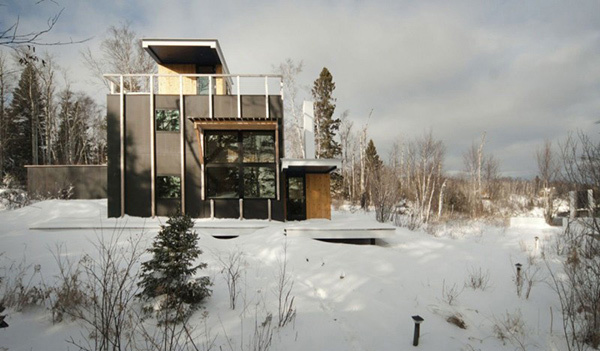 In addition to the visual warmth, the cabin is designed for superior thermal comfort with minimal energy use through the use of super-insulated walls, triple-glazed high performance windows and thermal-bridge-free insulation details for the floors above the existing foundation. 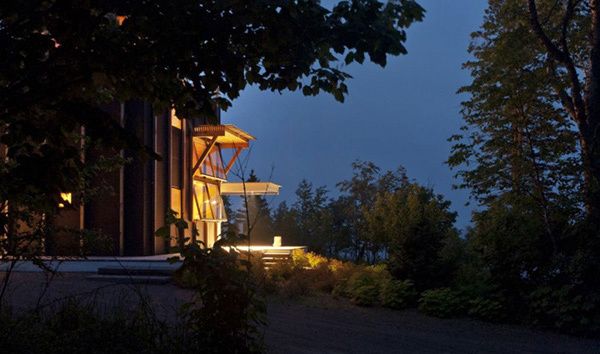 The new garage is designed to act as structure and armature for future solar panels.” The designers really planned well for this house seen not just in its architecture but even for the materials used in the construction of Rierson Cabin.